Wander over to the Baileys Harbor Range Lights at the Ridges Sanctuary. A naturalist guided hike will allow you to fully enjoy the myriad of rare wildflowers. Hiking will leave you with an appetite worthy of the Harbor Fish Market’s chowder. Spend the afternoon visiting the shops in town. The leisurely pace of our little village will charm you. Share a bottle of wine on your balcony. Dining is a short stroll through town to Chives for an imaginative offering of small, medium and large plates and a memorable walk back to the inn under a canopy of brilliant stars. Bike through town after breakfast and visit Boynton Chapel, built in the style of an ancient Norwegian Stavkirke. Pick up box lunches at the Yum-Yum Tree and bike right past the Inn to Toft Point. Revel in a solitary picnic lunch on the limestone shelf overlooking Lake Michigan or choose the old homestead clearing on Moonlight Bay, now a field of wild lupines in June. Spring signals the opening of garden shops and greenhouses. McKeefry & Yeomans in Ephraim and Jerry’s Flowers in Sister Bay are must stops for gardening inspiration. On to The Waterfront in Sister Bay for heavenly sunset views and inventively fresh cuisine. A round at any of the 11 golf courses on the peninsula is a particular treat in spring when the shades of green seem infinite. 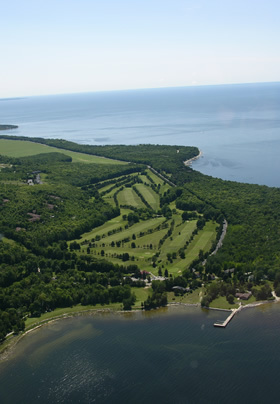 Maxwelton Braes is a lovely mature course in Baileys Harbor or the courses at the Alpine and Peninsula State Park will inspire your game with breathtaking views of Green Bay. Enjoy lunch between nines at the course. 18 holes should leave you with an appetite worthy of hearty Italian cuisine at Pasta Vino, in Sister Bay. Ten minutes to the Skyway Drive-In Theatre, a retro experience featuring current films. A visit to Door County is not complete without time spent in the village of Ephraim. Tours by the Ephraim Historical Foundation and views of the bluffs across the harbor are most memorable. Leroy’s Coffee House is a lovely way to relax. The shops that are sprinkled throughout town are a delight. Grab a second breakfast at Good Eggs for a truly local experience. An aerial tour of the peninsula from the Ephraim/Gibraltar Airport provides breathtaking views. A short drive to Fish Creek transports you to Mr. Helsinki’s for an eclectic array of dining choices graciously served in a cozy wine bar atmosphere with savory and sweet crepes headlining the menu. Birdwatchers are in heaven here as the spring migration swells the bird population, 26 species sighted in one morning. Bike to the end of Toft Point and spot the swans with their cygnets. Watch for the eagles that nest on the point. Listen for the Sandhill Crane’s prehistoric call as they fly overhead each morning and evening. Lunch at the Cornerstone, just a block away. Hunt the Kangaroo Lake Land Trust Preserve for morel mushrooms and wild leeks. Dine on the Coyote Roadhouse’s famous ribs. Pause on the causeway to listen to the chorus of frogs. Back at the inn those same tiny tree frogs, known as Spring Peepers, will serenade you to sleep. Savor the view one last time over breakfast. Say goodbye, we’ll welcome you back before you leave! But don’t panic, there is one last stop in Door County on the way south. Sturgeon Bay, a town of ten thousand, makes for a gradual easing back into the world of stop and go lights! The enticement here is the Door County Maritime Museum and lunch at the Bluefront Café.